this story tells a legend and the history of the island which is placed in the southern part of the lake, that is clearly visible starting from Maderno and that one can visit by driving to the little harbour of Barbarano, shortly after Gardone (40 minutes drive from the Hotel Riviera). THE LEGEND: Once upon a time, when the lake used to be called after the Roman god ‘Benacus’, who dwelled on its mountains peacefully, the lake shore were inhabited by little fishermen villages. The fishermen, devoted to their god Benacus, decided to create a temple on a little island with the most beautiful marmo stone which could have been taken by the near hills. They build gardens and brought all sorts of flowers. Once the temple was erected they decided to open it with a big feast, after all the celebrations on the island there should have been only vestals, virgin girl only devoted to their god ‘Benacus’. Though the girls were really beautiful and the fishermen were attracted by their charm. Also the girls could hear their songs and started to walk down to the beaches to see who they were and during full moon the fishermen conquered the girls. The consequence of the fact that the vestals had betrayed their votes the god Benacus became furious and stirred up a heavy storm, lightening, thunders and winds that made the island sink back in the waters and before the island disappeared forever the vestals were transformed into sardelle ‘sardene’ for this reason this part of the lake is still rich with this kind of fish. IN SEARCH OF AN ISLAND: Fascinated by this story I decided, after dinner, to discover this mysterious island and drove south towards Gargnano, Gardone and Salò went further towards the lakeshore of Salò and drove towards Portese and from the main road, that was leading towards San Felice del Benaco, I turned on the left and found the church of SAN FERMO. Fortunately if was dark so I could park somewhere and walked to the church and behind the yard of the church on the left, I found a passage and walked to the end of the green through the trees, cypresses and bay, I could smell their scent in the night….. and there it was in front of me shining in the moon, the island, the marvellous trees were slightly whispering in the wind and the top of a palace was glaring with its white stone. I sat there writing my impressions inspired by the place that had the charm of a lost place. This point had an immense attraction I could hardly move, I layed down on the grass watching the stars, the moon and breathing the warmth of the summer. I decided to drive back to the Hotel Riviera in Limone and inquire more. I had to visit this place by day. THE VISIT: the next day was Thursday fortunately, as Thursday is one of the day of visit. Reached Barbarano harbour at 9,30 the private boats lead me on the island. The atmosphere here is wonderful and captured by its nature and its history I could stroll around with a guide who was explaining me the meaning of it across the centuries…………. ‘The island could be considered like a box that contains a train of events that mirror the history of the people who lived around the lake. It has welcomed people from Roman times to the Lombards as shown by the 130 Gallic-Roman tablets that were unearthed and subsequently donated to the Roman museum in Brescia. The island was first mentioned in a decree by Charlemagne dated 879 in which it was given to the brotherhood of San Zeno of Verona. It was a place for meditation and was used as such by St. Francis, St. Anthony of Padua and St. Bernard of Siena. The latter gave it a new lease of life in 1429 when the old monastery was renovated and enlarged and became an important ecclesiastical centre. It fell into decline until in 1778 Napoleon and the Cisalpina Republic acquired the right to the island. After that, instead of belonging to the state, it belonged to a succession of different owners: Gian Battista Conter (1800), the Benedetti brotherhood of Portese (1803), Giovanni Fiorentini of Milan (1806) and Count Luigi Lechi of Brescia (1817). For many years a famous singer, Adelaide Malanotte, lived on the island because of her friendship with the Lechi family. Between 1880 and 1900 the new owners, Duke Gaetano de Ferrari of Genoa and his wife the Russian Archduchess Maria Annenkoff dedicated themselves to the creation of a splendid park. The villa was built between 1890 and 1903 in neogothic-venetian style, designed by the architect Luigi Rovelli. The facades have arched windows and on the south-west corner the tower has stone battlements with flower decorations in the neogothic style. After the death of the Archduchess, the island was inherited by her daughter Anna Maria, who was married to Prince Scipione Borghese of Rome. 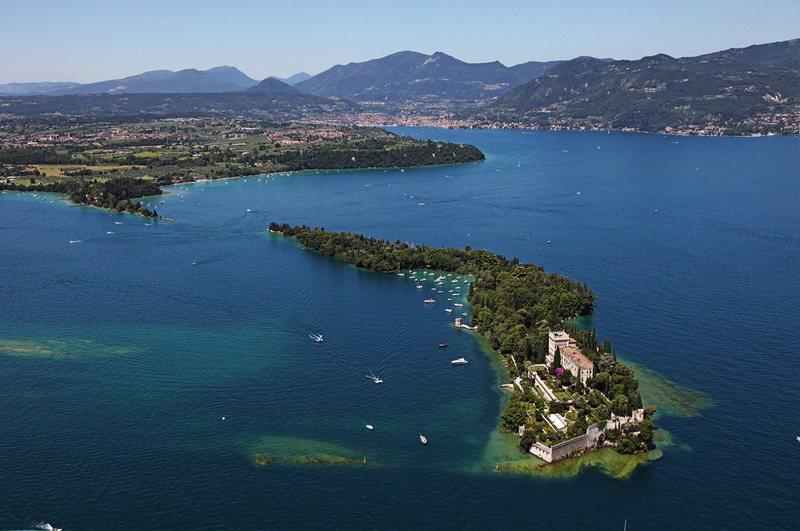 The Prince died in 1927 and the island was then inherited by his daughter Livia, married to Count Alessandro Cavazza of Bologna, who maintained the island in perfect condition and passed it on to her son Camillo and his family who live there to this day’. By the telling of the story we reached the saloon of the palace and I stopped in front of a huge painting, Alberta seeing my interest in it explained me who these women were. It was the countess Charlotte Tal¬bot Chetw¬ynd, her mother with her sisters and children who were of an aristocratic Irish family. Unfortunately I had to move on, the visit was over and everybody was waiting for me at the little harbor which was supposed to bring us home.